RESCHEDULED: Showing of the Film "Praying with Lior"
In honor of February as national disabilities awareness month, please join your fellow Mishkan family for a communal viewing of the award-winning documentary Praying With Lior. The viewing will be followed by a Q&A with the subject of the documentary, Lior Liebling, his father Rabbi Mordechai Liebling, and his stepmother Lynne Iser. All three are long-time Mishkan Shalom members. 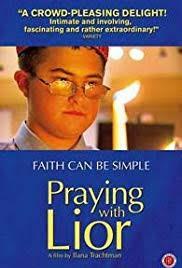 This beautiful documentary follows Lior as a 12-year-old youth with Down Syndrome on his journey toward becoming bar mitzvah, while also coping with his mother’s fight and eventual death from cancer. Filmed at Mishkan, the film was released in 2008 and was the winner of 5 film-making awards. $5 - $10 donation* Suggested but not required *All proceeds benefit the Mishkan Shalom Congregational School.